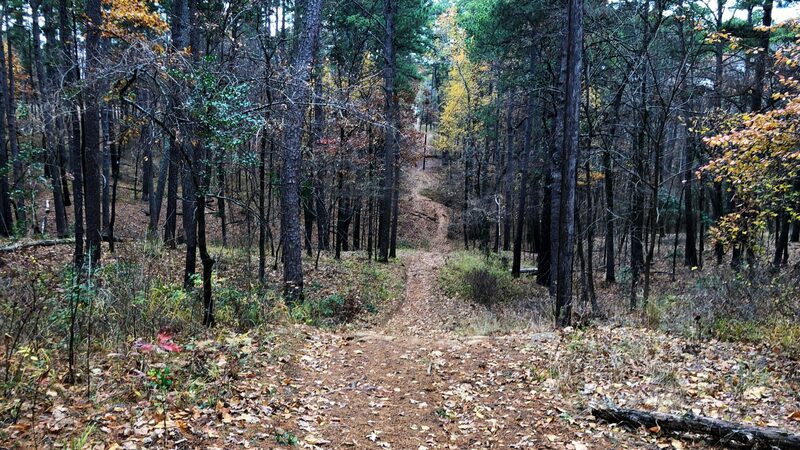 When we upgraded to 19.5″ tires we were told that TPMS could be made to work. We spent a couple hundred dollars in addition to the wheels and tires to buy new TPMS sensors and straps to hold them in, since they are integrated into the valve stems and the Vision 81 wheels require stronger bolt-in stems. In reality, the thicker sidewalls and steel belting interferes to much and causes them to fail to reliably check in with the vehicle. In a lot of ways, I’m not overly concerned about knowing my tire pressures when running down the road. I stay on top of maintenance, check pressure often, and replace tires well before they are due. But without TPMS reliably working, I’m met with a prompt on the dash every time I turn on the vehicle that I have to acknowledge in order to see anything in the information center. It comes back randomly when driving, and there is always a light on the dash. Being that it’s a new and expensive truck, I’m not satisfied with that arrangement. 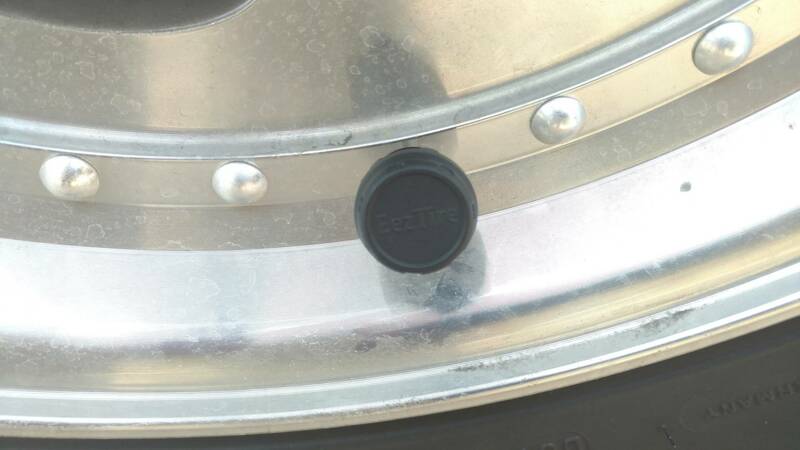 After a lot of research, I decided to install a third party TPMS system designed for RV and OTR truck use that gives pressures for both the tow vehicle and a trailer, if attached. These get around putting the sensors inside the tires by fitting over the valve stems. 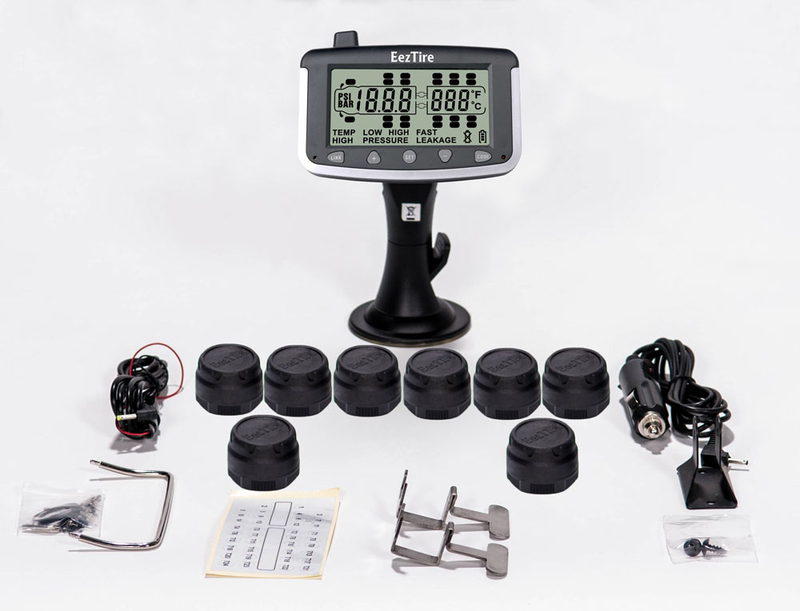 While I’m not overly concerned about these pressures as I mentioned above, I do realize their merit for safety, so I went ahead and used this as an excuse to purchase an EEZTire 8 sensor TPMS system. 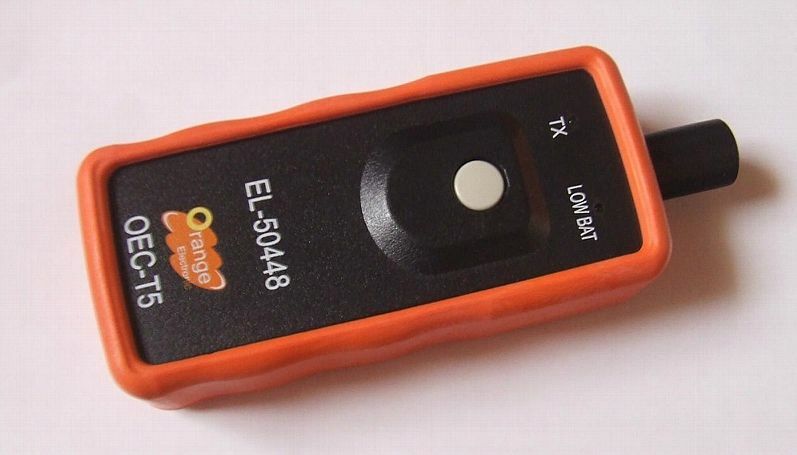 I will use this instead of factory system on my truck, supplement that system to track the trailer tire pressure and temperature as well, and will improvise a method to trick the factory system into thinking everything is fine with the onboard sensors. The kit contains a screen that you mount on your dash, much like a GPS system, power cables, and eight external sensors that you screw onto the valve stems. It also comes with “anti-theft” devices that fit over the sensors to keep them from being stolen, but I found them to be gimmicky and very easy to work around. 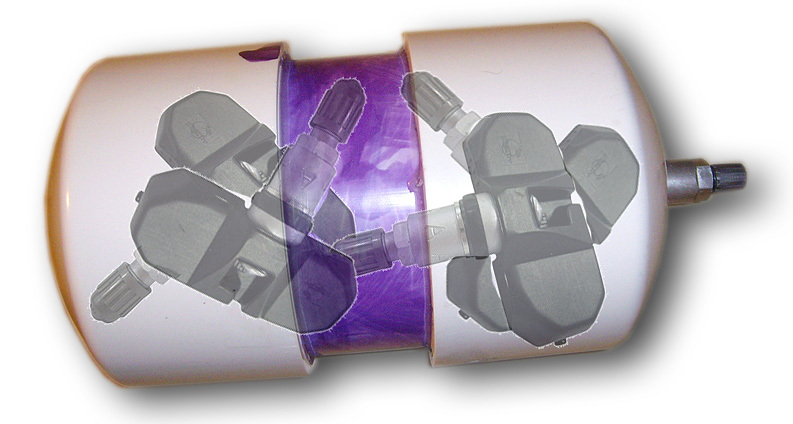 The concept behind them is to create a cylinder that twists around on the sensor rather than letting the sensor itself be twisted, however, you can easily decouple them from the sensors and grab onto the sensors directly. They are only useful against people who have never seen these systems before, or potential thieves that don’t take twenty seconds to inspect them. It only took a few minutes to program all eight of the sensors to the unit, which is as simple as choosing a position, putting it into learn mode, and then holding the sensor next to the unit. 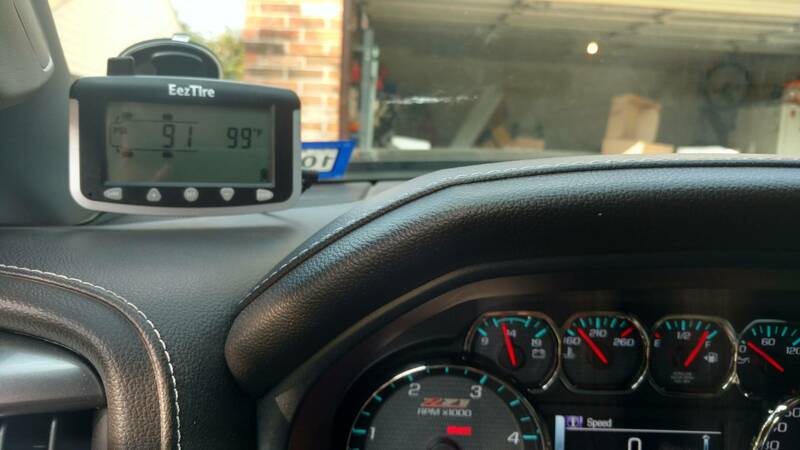 You have to keep track of which positions the sensors go in so that you can use the visual readout that shows you the tires by location, with their pressure and temperature, and alarms you if the ranges you set for those two elements are exceeded. When the unit alarm goes off, it flashes a red light in the lower right corner and beeps constantly — very annoying but it does get your attention. I used a fuse tee to tie into an ignition controlled fuse and ran the hardwire kit up to the dash, where it neatly exits right behind the unit, which I attached to the windshield using the included suction mount. One of the best features of the unit is that you can tell it whether or not you have a trailer attached, and it will monitor accordingly. If you need to boost your signal due to the length of your rig, they do have repeaters that you can buy, though based on reviews I opted to try without one first. Once again, we bought the eight sensor system, with one sensor for each of the four truck tires and the four trailer tires. … short the TX button so that it is always on, and hardwire it into the ignition of the vehicle. That way as long as the truck is started, it will be sending out the signal required to keep the sensors awake. Or I could rig it so that it only sends the signal every few minutes while the ignition is on. I’m also fairly certain that signal is only a constant 125Khz tone, so I may be able to improvise a cleaner solution with a cheaper radio kit. Another option I’m looking at is capturing the signal that the sensors put out, at 315Mhz, and replicating it with an Arduino so that no TPMS sensors are required at all. That will take a lot more time, though, and I’m wanting to at least implement a temporary solution this week. I may figure that out later.